Can't bake to save yourself? Then THIS is a recipe for you! Make this little sweetie for a gift or something for the play kitchen for the kids. It's really simple and only takes a few ingredients. First step is to place a good amount of glue in the bottom of the patty case. Then place your pom-pom into the patty case on top of the glue, pressing down firmly. Using your scissors take the 6 bright colour yarns, cut a 10cm length of each colour. Grab the bowl and hold the lengths of yarn together, close to the ends (in a bunch), snip the yarn ends to make your sprinkles (around 0.5cm in length). Add a good dash of glitter to the bowl with the wool sprinkles, mixing well. 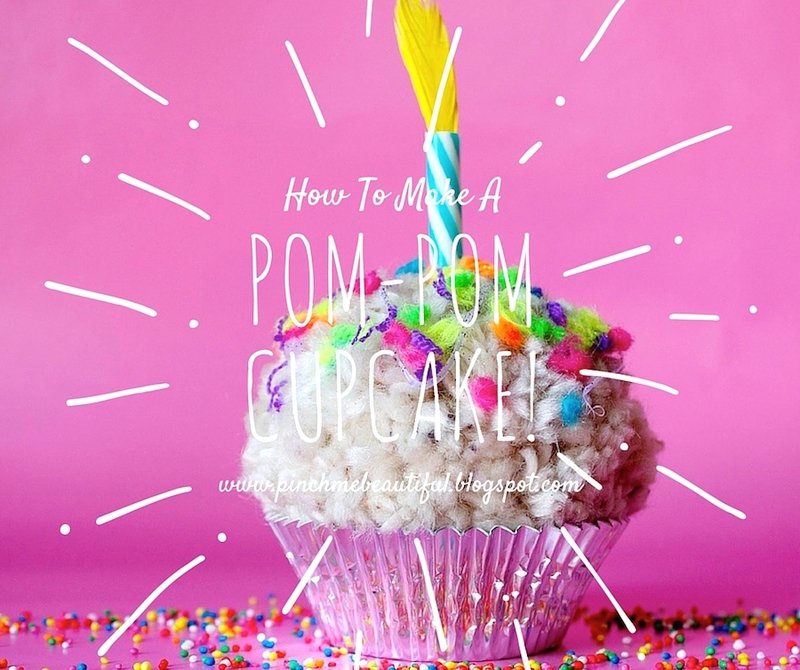 The pom-pom and glue should be secure and dry in the patty case, now it's time to decorate your 'cupcake'. Have your bowl of 'wool sprinkles' and glitter close, you'll need to do the next step quickly. 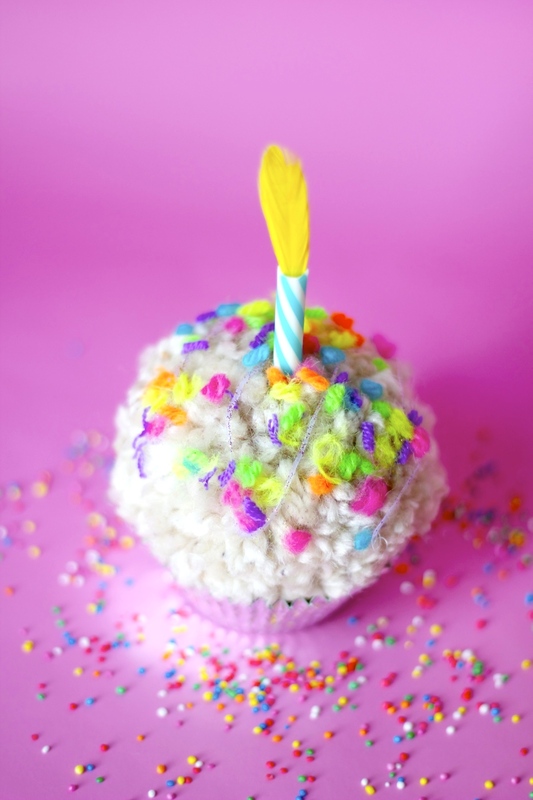 Take the hot glue gun and drizzle some glue over the top of the cupcake, then quickly dip your cupcake into the bowl of sprinkles and glitter (the glue will dry pretty fast) pressing down firmly. (Note: the glue probably won't stick the wool sprinkles to the pom-pom, mostly just the glitter. The wool sprinkles will hold themselves to the pom-pom, but they will easily pull off, so handle with care). Your cupcake is looking pretty, ..... now for the candle! 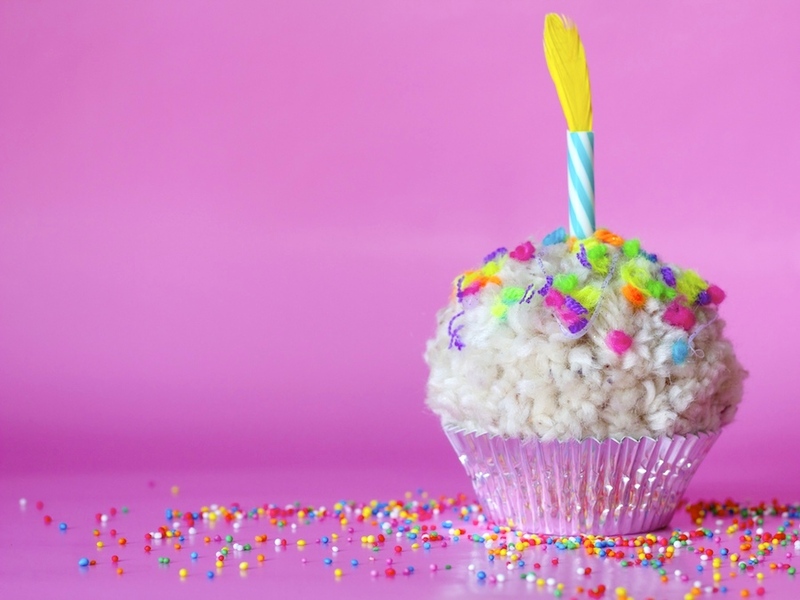 Take your straw and measure it next to your cupcake to get the right height for your candle. (The height of the cupcake plus the candle extension). Cut the straw and carefully push the straw through the centre of the pom-pom, cut end down. Now add a small amount of glue to the stick of your feather and quickly place it into the straw to create a flame effect. That's it! You're done. One sweet little pom-pom cupcake for the kids to play with at their playtime picnics or give it to a friend on their birthday as a 'guilt free' pleasure. (Note: I wouldn't recommend this for a child under 4 years. Other than trying to eat it, they may pull it apart rather quickly). This is absolutely GORGEOUS!!!! I love it! These are too cute, I want one for my birthday! Thanks for sharing wonderful recipe of cupcakes with us. Thanks for sharing such a nice post here with us. Seriously! 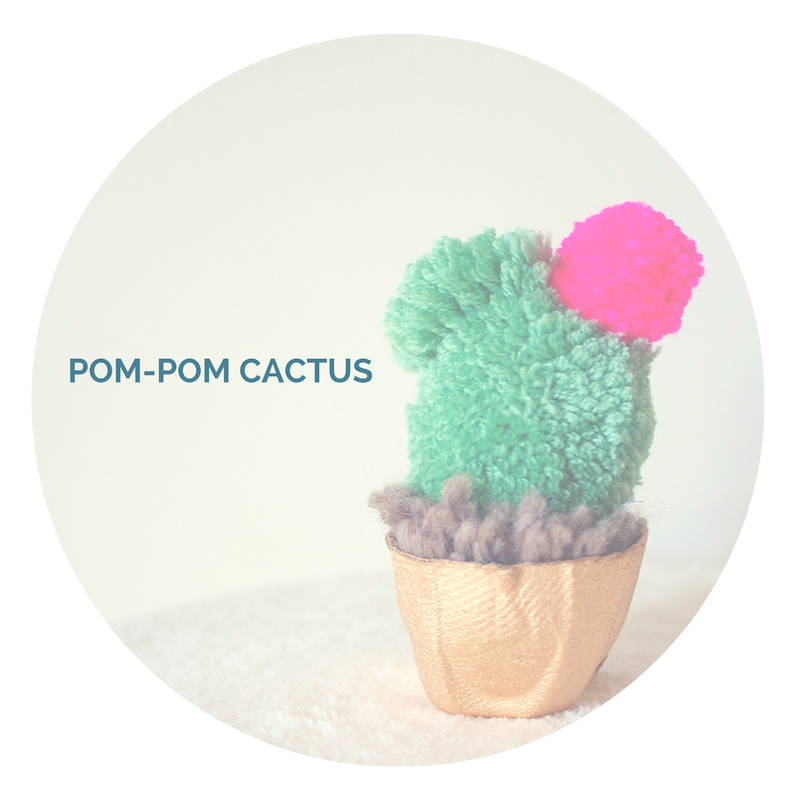 How much fun are pom-poms? It doesn't matter if you're five or eighty two it's something you can make and once you've mastered the basic pom-pom you'll be able to knock this bad boy up in no time. One medium sized green pom-pomOne small sized pink pom-pomOne medium sized brown pom-pomScissors Glue (I highly recommend using a hot glue gun, much easier and less messy).Cardboard egg container (to use one cup section as the cacti's little pot). Some Paint (I used gold spray paint). Firstly cut and trim one egg cup section from the carton. Paint your egg cup container 'Pot' and leave it to dry. It should be dry by the time you have finished cutting your cactus into shape. Make your three different pom-poms in the colours and sizes needed. (Make sure you leave the tied pom-pom strings through the centre of the pom-poms long, you'll need these to tie your pink and green pom-poms together). Summer is now behind us, and to me that is exciting as it means lots of NEW Winter stock arriving with beautiful NEW colours to create lovely NEW warm knitted wooly projects!!! With the cold Winter months on their way, there is nothing so special as cuddling into a warm knitted woolly blanket!! Now don't shudder & say "but it's such a big project", lol, as I am going to tell you how to break it down into a really manageable & fun project! 1. Decide on Size - I find for your first throw, don't go too big, do a cot size, or a nice Knee Throw to snuggle on the lounge. Winter Is Coming, so exciting!!!! This is my time of the year, to be able to make a beautiful piece of Winter Warmth to wrap yourself or loved ones in, brilliant!! I am so pleased to join you again, & many thanks for you kind words & enthusiasm over my last edition How To Knit A Blanket.